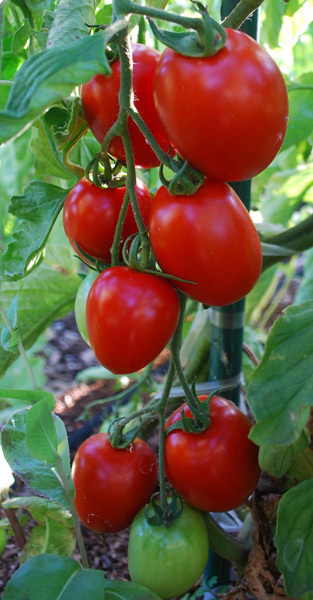 Growing tomatoes in cool-summer or short-season gardens can be a real challenge. I grew tomatoes at the edge of the fog belt south of San Francisco for 15 years, so I know how difficult and frustrating growing tomatoes in cool climates can be. Select Early Varieties. Early tomato varieties set fruit at lower temperatures. They tend to be smaller tomatoes—cherry and salad types—and usually start producing tomatoes within 60-70 days of planting. Many are bush (determinate) varieties, but there are several vining (indeterminate) early tomatoes as well. Plant tomatoes in your warmest microclimate. If you have a south-facing wall, plant them along the bottom of the wall. Get the plants in early. You may have to use season-extenders like cloches, heavy floating row covers, or wall-o-waters to protect them from frost or cold weather early in the season, but an early start is critical in a cool-summer or short-season climate. The idea is to maximize the number of tomatoes on the vine when peak summer heat arrives. Use a dark-colored mulch, or no mulch at all. I’m a big advocate of mulch, wherever keeping the soil cooler and holding in moisture are advantages. When growing tomatoes in cool-summer areas, this is not the case, so a dark mulch or no mulch is better. Red Plastic “Mulch” reflects red frequencies of light and may increase ripening up to 20% in cool-summer climates. If you have an apple tree, toss windfall apples under the tomatoes. Apples give off ethylene gas, which acts as a ripening hormone. Harvest all fruit that shows any color before the first frost. Place slightly ripened tomatoes on windowsills indoors, or on a tray on top of the refrigerator. The tomatoes will continue to ripen indoors. They won’t be anything like vine-ripened tomatoes, but they’ll be better than anything you’d find in the supermarket.